Sonic, spacey-indie rock hip-hop? That's right. 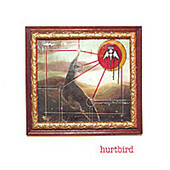 Hurtbird's self-titled, debut full-length combines rich, spacey, atmospheric texture and indie-rock diversions, all with a rapper at the forefront. Smooth rhymes go with the dream-esque soundscapes, allowing Hurtbird to hit the head on something new, an up-and-coming sound that melds two very different worlds in an almost perfect unison. Throw in some dreamy backing and lead vocals, complimenting the rhymes, and the songs unique atmosphere is brought to life. Hurtbird isn't the first to bring hip-hop into rock, but they do it a lot more dreamier and beautiful than most. I'll give this a B.